In 2010, then General Manager AJ Smith traded up 16 spots in the first round to take Fresno State running back Ryan Matthews with the 12th overall pick in the NFL Draft. Matthews was talented to be sure, with plenty of speed and big play potential. Durability, however, was a major question mark. But then again, coming out of the University of Oklahoma, durability was a major question mark for Adrian Peterson, now of the Minnesota Vikings. That worked out OK, and the Chargers needed a feature back with the departure of the aging LaDainian Tomlinson. At the time, it seemed like a worthwhile gamble. Fast forward three plus years, and the gamble doesn’t seem to be paying off. He’s missed 10 games due to injury, started only nine of 12 games in both 2010 and 2012, and has fumbled the ball 13 times, with several coming in critical situations at the goal line with the team poised to score, most recently in week two against the Philadelphia Eagles. In comparison, in 10 years and a career 170 games, Tomlinson had 30 total fumbles (rushing and receiving), an average of .0079 fumbles for every time he touched the football. In 15 years and 226 career games, Emmitt Smith fumbled 45 times for a .0091 per touch average. Mathews, in three years and three games, is averaging .018 fumbles per touch, more than double the rate of his legendary predecessor. 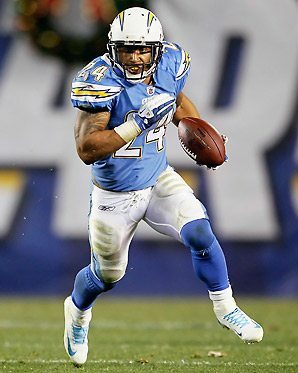 Ryan Mathews is clearly the most dynamic and talented running back on the Chargers’ roster. With all due respect to Danny Woodhead, who is a nice situational back, Mathews should be the guy they lean on in ALL situations, except for maybe in pass protection. Instead, Mathews seems to get buried on the bench for long stretches. This new coaching staff led by head coach Mike McCoy clearly doesn’t trust their “star” running back, opting for less talented but more reliable alternatives like Woodhead and Ronnie Brown. The problem is that his fumble problem has not been solved, and that’s a serious problem. You can’t trust a guy who can’t seem to hold on to the ball—his primary mission as a player. One wonders what it will take for Mathews to be the reliable every down playmaker he should be. And it’s a mystery as to why it hasn’t been fixed yet after over three years in the professional ranks. I cannot believe that it’s a matter of coaching. I know running backs coach Ollie Wilson; I’ve worked with him, and I’ve seen him work with his players. He’s one of the best running backs coaches in the business, and I’m certain he has done everything he knows how to do in order to fix Mathews’ ball security quandary. Which pretty much leaves only one conclusion: Ryan Mathews simply doesn’t care enough to fix it. At some point it falls on the player himself to decide to get it right. And it doesn’t seem to be important enough to him, which tells you something about the man’s character. Ball security issues are not difficult to solve, as long as the player in question places a high enough importance on it. Just ask former New York Giants running back Tiki Barber, who went from being one of the most fumble prone backs in all of football to being one of the most reliable. It was important to him to fix the problem, so he did. The Chargers’ brass has a decision to make, and soon. They cannot continue to keep their most talented runner on the sideline out of fear that he’ll cough up the pill. He’s the guy who should be scoring touchdowns in red zone situations, not Ronnie Brown, who has become one dimensional—and slow— since being drafted in the first round out of Auburn University (Brown scored the Chargers’ first rushing TD since week five of the 2012 season on Sunday against the Titans). They’re paying Mathews far too much money for him to be a healthy spectator. At some point they’ll have to decide whether they trust him enough to correct his issues or simply part ways and find someone more reliable to carry the load. What’s happening on Montezuma Mesa could quite possibly be even more disappointing if you’re a long suffering Aztec. The Aztecs went from winning a share of the Mountain West Conference championship in 2012 to an 0-3 start in 2013, losing by an embarrassing 40-19 at home to FCS opponent Eastern Illinois, getting blown out by Ohio St. (but really, that was expected), and this past Saturday they lost a game that they had all but sewn up at home to Pac 12 contender Oregon St. It was a complete meltdown by head coach Rocky Long’s signature unit—the defense—that precipitated the team’s demise, although the offense didn’t fare much better down the critical home stretch. This was a team that, under current Michigan head coach Brady Hoke, was one of the best coached groups in the history of San Diego State football. That trend seemed to continue for the first two years of Rocky Long’s tenure, culminating in astonishing road victories at Nevada and perennial conference powerhouse Boise St., good enough to claim a third of the conference title in 2012 and the team’s third consecutive bowl berth (a humiliating loss in Qualcomm Stadium’s Holiday Bowl to arch nemesis BYU). The departure of offensive coordinator Andy Ludwig to the same position at Wisconsin certainly has something to do with the offense’s woes at the start of the season. Gone is the power running game that fueled the Aztecs’ title run a year ago in favor of new coordinator Bob Toledo’s West Coast passing attack. And the offensive line has been a disaster under second year line coach Mike Schmidt, himself a former Aztec guard. But more troubling is the complete defensive collapse. This is year five of Rocky Long’s complex 3-3-5 system on The Mesa that relies heavily on man coverage and pressuring the quarterback. Even with new faces in the lineup, there shouldn’t be an enormous amount of assignment confusion, yet that’s precisely what we’re seeing. Corners are peeking into the backfield in man coverage and getting burned because of it; they are playing off and soft and giving up critical first downs and touchdowns; and in tight formations players don’t know who they’re supposed to cover, getting torched for a TD late in the fourth quarter against Oregon St. on a simple wheel route by an offset running back, where veteran linebacker Jake Fely not only blew his assignment, but missed the tackle to give up the score that pulled the Beavers to within two points with 2:41 left to play. Aztec QB Quinn Kaehler, starting his first Division 1 football game, threw a pick six on the ensuing series, giving the Beavers the win. The SDSU defense was torched for 361 passing yards and three TD’s against Eastern Illinois, and 367 yards and another three TD’s against Oregon St. That’s simply not winning football. The coaching staff knew it would be a struggle with two new starters at the cornerback positions, but this is ridiculous. It’s frightening to imagine how Fresno St.’s prolific passing attack—with Derek Carr at the helm—is going to pick apart this secondary. That crucial MWC Western Division matchup is looking less and less winnable by the week. Watching this team play it has become clear that they are not a well coached group. It’s a shame, too, because it looked like SDSU was FINALLY going to get a football program that would become a source of pride for this region the way its basketball program has been. If there is any hope of salvaging what seems to be a lost season, the players and the coaches both must step up their game.